The largest and most important role of the medical industry is to provide quality healthcare services to patients. And–in an ideal world–patients should be the center of a physician’s day to day. However, for many practices, this is not the case. Due to a number of regulatory hurdles that must be managed, physician must also provide their services in accounting, management and medical transcription as well. 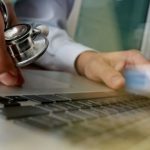 The accuracy and efficiency of inputted data into EHRs is imperative for proper medical records–which is why physicians spend so much of their time getting it right. Because the documentation of patient information into EHR takes so much time away from our physicians, many medical practices hire scribes to do it for them. The question is: Should the service be in-house or outsourced? That’s what we’re here to flesh out. Some people think that it’s easier to hire and train a medical transcriptionist to provide quality work. This is true if you have the time and resources to train someone to fully understand your needs. Otherwise, the training costs and time consumption can actually end up making your practice less productive. Additionally, the cost of an in-house professional may not be the most affordable option long-term. In most cases, a third-party medical service will be needed to proofread the work of the in-house transcriptionist. This means more money out of your pocket. Furthermore, when an in-house medical transcriptionist takes time off of work, the medical practice will not have a plan to cover the duties during this time. This backlog of transcription work can cause delays in billing and timeliness in seeing patients. Many practices are hesitant to outsource their transcription services due to the fear of compromised data security. When in actuality, the level of security measure taken is often higher than what occurs in the medical practice’s office. For example, many practices let their in-house medical transcriptionists take work home or log in outside of the secured practice network. Unless a medical practice has stringent security standards, it makes more sense to partner with a trusted third-party medical transcription service company than to opt for an in-house scribe. Many practices believe that because the in-house staff is on hand it’s easier to communicate with them on a day-to-day basis. But with a professional transcription company, they have staff on hand ready and waiting to help. The technology is such that a simple instant message or a phone call is easier in many cases than walking down the hall or to the other side of the building to have a conversation. Many companies, like DataMatrix Medical, have the technology to provide the best workflow, giving the medical practice the ability to look at a screen and know what has been dictated and request stat work with the simple push of a button. If you hire an in-house transcriptionist to work for you they are not bringing this efficient technology with them. External medical transcription providers have the experience and bandwidth necessary for quality transcription services. In other words, As a result, your medical practice does not have to spend a dime on hiring and training. Besides, they get paid for the work done. That is, during low workload, you won’t have to pay a fixed fee as with the employee. Even better, their work is not affected by sick days and leave days. A medical transcription company employs a team of transcriptionists to each of your physicians. These virtual scribes are trained to create medical reports completely accurate and concise, even down to the grammar and punctuation. This means that there are several professional eyes checking and re-checking the documents for accuracy. Besides quality, outsourcing a transcription service also improves the rate at which work is done. Companies always assign a task to specific individuals who work hard to meet the deadline. In some cases, the work might be too much for the in-house personnel to handle within the particular timeframe. With a team of transcriptionists from a third-party vendor, the documentation is done at the time the patient’s visit–meaning reports will always be done on time. The only thing a service provider worries about is the next project. If they can maintain you as one of their clients, the better for them. You can be certain that they will not leave you along the way to handle another customer. Instead, they will hire more hands to help out. Hiring an in-house transcriptionist will require that you spend money on buying computers, data storage, and other necessary equipment. You will also have to upgrade these facilities time to time to keep up with technological changes. With an outsourced provider, this equipment comes with them. 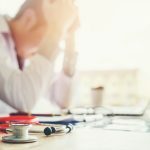 With the amount of managerial and laborious tasks that physicians are expected to complete (including inputting data into EHRs), there’s hardly enough time actually care for patients. This is why hiring a company that can free up any and all time for your physicians is key for better patient care. Inevitably, there many misconceptions and fears about outsourcing transcription work. But as we now know, the productivity and quality that comes with outsourcing your medical transcription services is far more than that of an in-house scribe. At DataMatrix Medical, we make it our mission to help physicians and their staff carry out the best possible patient care through our highly-competitive services. We provide medical transcription and EHR integration services, all while helping practices remain HIPAA compliant–something that has become increasingly harder to maintain with the adoption of EHR. For more information on our services, get in touch with one of our specialists today.